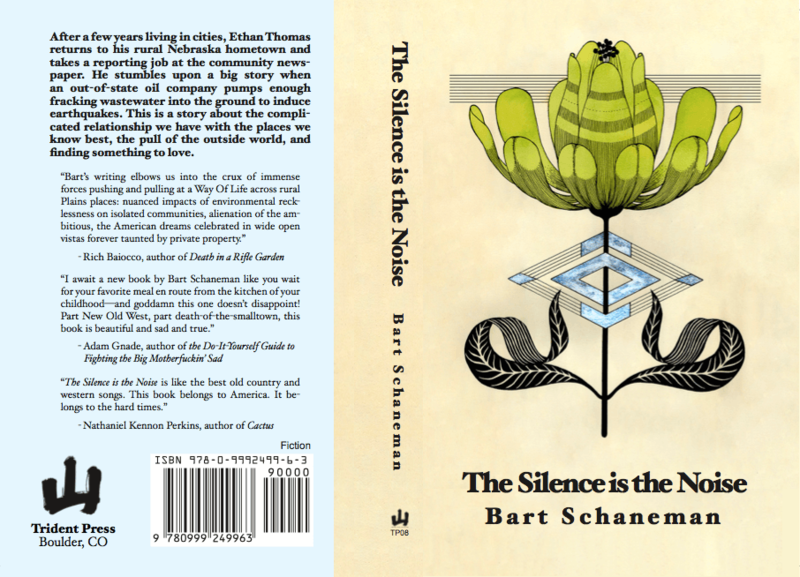 This awesome reading is an excerpt from The Silence is the Noise, a short novel by Bart Schaneman, published on Aug. 30, 2018, by Trident Press in Boulder, Colorado. You can order the book here. Thanks, Bart. Listen. Read. Enjoy! When I get to her house she’s sitting on the back deck talking on the phone. Since I saw her last she has cut her hair short and it’s back to her original color — black. She looks like a raven, a creature that could pick up and fly away at a moment’s notice. I walk up and she smiles as she talks to a friend in another city. I wait, trying not to listen to her as she speaks in her slightly raspy, mirthful voice. The sun falls below the horizon behind the bluff on the far side of the valley. I watch as a lone firefly blinks in the tall grass next to the barbed wire fence. Birds in the cottonwoods along the road. I can hear the coal train running down along the river. Its horn sends waves of sound out over the land, breaking over us. I wait. When she finishes the call she sits looking out over the valley, smiling. I get in the truck and she makes me wait some more before she joins me. She hands me a water bottle full of cold, dark brown sun tea. I drive down over the river, through the two little towns. We’re talking about tornadoes and she looks out the window quiet, coolly taking it in. We pass an underground missile silo with a tall chainlink fence and a blinking red light. I turn at the next road and drive into a lot that’s been cleared for gravel mining. Park alongside a brokedown truck and get out. I lead up through the pasture. The drought is in its fifth year and there are few flying insects, just our feet making tufts of dust in the shrubs. The breeze carries on it the sweet smell of the prairie. We hike to the base of the exposed sandstone and sit on a patch of grass. From up there we can hear the dim white noise of the missile silo humming below. Yellow dots from ranch yardlights speck the dark land. We can see the edge of the valley dozens of miles away, and below it the cluster of lights that make up the town. I laugh and look out over the land, all the space that can be taken in by the eye. I lean in closer to her and when my face is close she pulls back. We quiet down and look out across the prairie. Across the valley three lightning bolts strike the top of the biggest bluff. Then the stampeding hoof clatter of distant thunder. A storm cloud smudges the stars and sky into a deep gray as it drifts toward us. Lightning webs the higher clouds like the circuitry of an electrified destroyer. Bolts spark from the hull to the ground. The rain hits just as we’re getting in the car. It comes down heavy, rushed, desperate. The sky flashes as we drive the dirt roads back to her place, the road noise louder in the truck from the mud on the tires hitting the undercarriage. “God that rain smells good,” she says. The quiet returns stronger than before. I see the green lights of horses’ eyes glinting by the roadside. This is her family’s land. I slow the truck and roll down my window. The instant the wheels stop spinning she’s out of the truck and at the fence. She places a hand on the neck of the brown mare with a star on her head, Lucy’s horse. One of the others, a tall, blaze-faced bay gelding approaches me with nostrils pumping to catch my scent. Heat and energy crackles around them as though they’ve been electrically charged. She steps up on the fence as the mare comes aside. She mounts and they lope off into the dark. 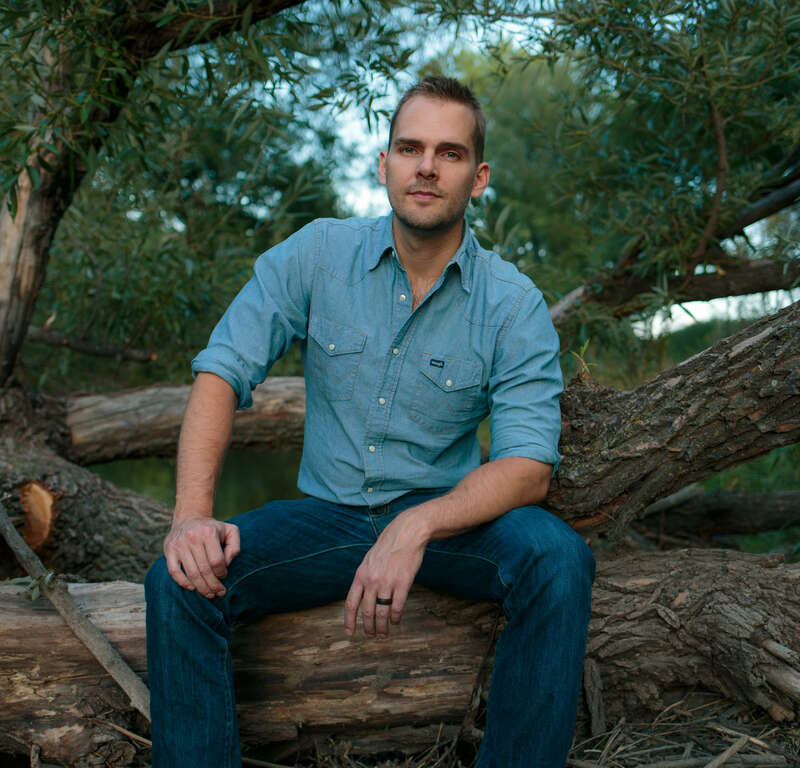 Bart Schaneman lives in Denver, Colorado, where he works as a business reporter covering the cannabis industry. He was raised on a farm in Nebraska, has worked as journalist for 15 years, and lived in Asia for five. He is also the author of the novel The Green and the Gold, the travelogue Trans-Siberian, and the collection of essays Someplace Else: On Wanderlust, Expatriate Life & the Call of the Wild. This entry was posted in Audio, Featured, Fiction, Lit, Reading and tagged Bart Schaneman, Denver, excerpt, humming, noise, rain, reading, Silence, The Silence Is The Noise, tomorrow, Trident Press. Bookmark the permalink.